Yes……I must admit…….I had all the plans and intention in the world in taking part in FNSI last night…….and hubby decided he’d take me out to dinner instead! Who am I to say no?? We rarely get out these days, and later, as I was telling him I was supposed to be hosting FNSI, he apologised profusely and said I should have told him…….in the middle of eye fillet steak with scallop and prawn topper in a creamy garlicky seafood sauce?? ?…..I don’t think so!!!! So once he was convinced you ladies could manage without me, we went for dessert at another cute little restaurant where we had chocolate lava puddings….mm mmmmmmm!!!! I never did get the chance to take a photo to share with you *burp*…..sorreeeeee!!!!!! Needless to say, it was just D-I-V-I-N-E!!!!! Well, I thought I would do some catch up when I got home and promptly sat in my chair to stitch (at least! ), got three stitches done and dropped off to sleep……must have something to do with a contented belly??!! SO, instead I worked on it being Friday night somewhere in the world today and stitched to my heart’s content all day!!!! My plans were to work on putting together my Homespun “Long Time Ago In Bethlehem” SAL and that’s what I did…. I was thinking I might frame each block in a darker fabric before I sash so today it was cutting blocks to size and framing…..
A nice chocolate brown Moda Grunge Basics did the trick…..and I’ll follow up with the sashing I showed you yesterday….it will turn out slightly bigger but that’s ok…..some modifications will make it more personal don’t you think? In fact, the more I look at that Innkeeper, the more he reminds me of hubby!!!!! LOL Maybe I’ve personalised it a little tooooo much??? hee hee. 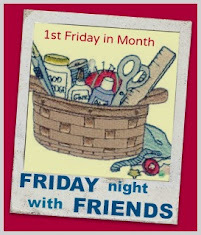 I’m off to see what others did in their timezones for FNSI…..why don’t you join me??? LOL Pleased you had a delicious meal with your dear Hubby. You were missed but yes we worked without you. So pleased you could dine with your hubby. Such special moments. Never say no to a lovely dinner, there is always another day to stitch. All are very nice sticker. A very fine stitches. Glad you had such a wonderful night, I would not have passed that up either. He is a Keeper. Not to be rude or pushy... but is there anything done about people who obviously joined just to promote their blog and did not actually participate? I think it is wrong to join these things and do that. Where can I get the first design in your Long Time Ago In Bethlehem set? I have downloaded all the rest, I couldn't find a place on Heritage site to order the magazine that it was originally in and couldn't find it on your site either. Sorry, my mistake I meant the Homespun site.